Place value means understanding the value represented by a number given its position. Although this concept sounds simple, learning it can be extremely difficult for many children. If this concept is not fully taught and understood, many problems will be encountered later. 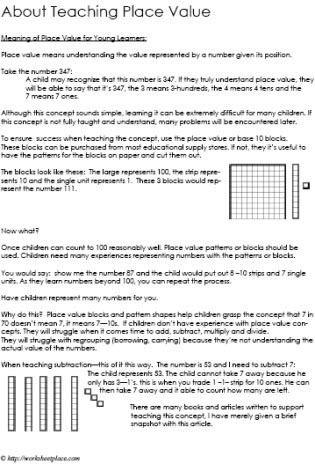 To ensure success when teaching the concept, use the place value or base 10 blocks. These blocks can be purchased from most educational supply stores. If not, they it's useful to have the patterns for the blocks on paper and cut them out. used. Children need many experiences representing numbers with the patterns or blocks. You would say: show me the number 87 and the child would put out 8 - 10 strips and 7 single units. As they learn numbers beyond 100, you can repeat the process. Have children represent many numbers for you. Why do this? Place value blocks and pattern shapes help children grasp the concept that 7 in 70 doesn't mean 7, it means 7 - 10s. If children don't have experience with place value concepts. They will struggle when it comes time to add, subtract, multiply and divide. They will struggle with regrouping (borrowing, carrying) because they're not understanding the actual value of the numbers. See all of the place value worksheets.